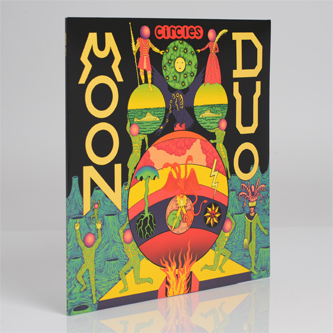 Moon Duo's 2012 cycle follows a class split with Psychic Ills for Sacred Bones to this, their psych, kraut and pop-charged new album called 'Circles' for Souterrain Transmissions. It's probably their most accessible effort to date, masterfully rendered by recording engineer Phil Manley (Trans AM, Life Coach) and finding the sweet spot between the darker themes of their 'Horror Tour' 12" and their lighter, brighter 'Mazes' debut. 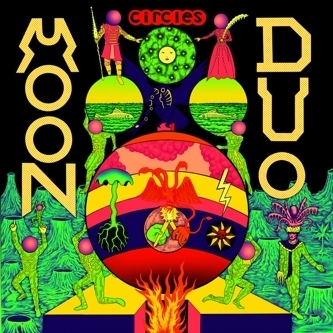 Their fuzz is now more angora than steel wool, spaciously cosseting Ripley's affected croon and Sanae's backing vocals with a psych-y inference that won't harsh your buzz, while the drums are crisp, sprightly even, embedded in requisite amounts of reverb to lure you onto the dancefloor with all the other dapper cool cats you see at their gigs. They've got hooks for days, too; shiny, well hewn and slightly smug melodies and chords with an authentically vintage-sounding '60s LSD dapple.